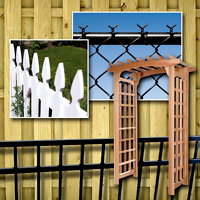 At All About Fences & More we truly take pride in knowing that our finished products look great, serve a purpose, and provide our customers with the quality they have come to expect. Through exploring the links below, you will see a variety of products we can produce. There will be short descriptions with general information about that product. Keep in mind that a huge part of our business comes from those customers who are looking for something a little different from the norm. You may be looking for something to fit a very specific purpose, and if you don’t see it listed here, please contact us for a FREE Custom Quote! We will be happy to assist you in any way we can. Click links below to find out MORE!